The chief of Aglagax took the woman home and had her sew boots of some very dry sea lion gullet [esophagus]. She sewed the dry gullet and finished a pair of boots. Her husband put them on and waded in a lake and his boots didn’t leak. Everyday boots had seal or sea lion soles and uppers made from seal or sea lion esophagus; caribou hide was also sometimes used, where available. Boots were sewn with whale or caribou sinew, which swelled when wet to make the seams completely watertight. This tall pair of boots, identified in museum records as “boots from an Aleutian chief,” is made of esophagus and ornamented along the seams with embroidery thread and around the cuffs with dyed-membrane appliqué and bands of fur seal. They are lined with red trade cloth. Daria Dirks: What the bottom is made of, the soles? Aron Crowell: How can you tell it’s flipper? Mary Bourdukofsky: The way the grain, that’s the way the flippers look. They’re not smooth. Maria Turnpaugh: This doesn’t look like flipper to me. Maybe it’s leather. Daria Dirks: They colored it some way. You can’t even see the seams on the bottom part. Mary Bourdukofsky: It’s sewn from inside. Vlass Shabolin: It must have been pretty soft when they worked on it in order for them to turn it inside out, because it’s got a liner in there. Aron Crowell: They’re lined with red cloth. Daria Dirks: That’s different fur on top? Daria Dirks: The trim is fancier than the other pair and more detail on it. Maria Turnpaugh: See that sewing again? Mary Bourdukofsky: To me it looks like it’s trimming that they got from Russia. Russians used to trade things to the Natives. Look how shiny the bottom is. Daria Dirks: What’s the Aleut word for this? Mary Bourdukofsky: I think this is what they used to call sapuugax^ [men’s knee-high boot]. (3) It’s not an Aleut word, it’s a Russian word. My dad always used to call his boots sapuugax^. Aron Crowell: Were his boots anything like this? Mary Bourdukofsky: No. As I was growing up I didn’t see homemade [boots], but he told a story about it. Maria Turnpaugh: They’d be shorter, like this [midpoint of boot upper]. But this is for special—for a uniform, a Russian general or whoever. Vlass Shabolin: A chief or somebody. Vlass Shabolin: Yes, maybe a ship captain, and he had somebody make it for him. Daria Dirks: An Aleut chief, that probably explains why this has more designs on it than the other ones. This guy had long legs. Maria Turnpaugh: This would have gone to their knees, because the Aleut legs are [laughs] . Vlass Shabolin: They are short. These would have looked like hip boots [laughs]! Mary Bourdukofsky: Must have been a pretty tall chief. 1. The term “hair seals” refers to various types of earless seals (family phocidae) including harbor seals, bearded seals, ribbon seals, spotted seals and ring seals—excluding fur seals (an eared seal). 2. This section includes comments from the discussion of a similar but less decorated pair of boots E048102. 3. Sapuugax^ is the singular form of sapuugan “men’s knee-high boots,” which were used for hunting, and comes from the Russian word sapóg “boot”]. The chief of Aglagax took the woman home and had her sew boots of some very dry sea lion gullet. She sewed the dry gullet [esophagus] and finished a pair of boots. Her husband put them on and waded in a lake and his boots didn’t leak. 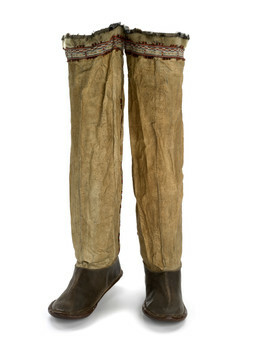 This tall pair, identified in museum records as “boots from an Aleutian chief,” is finely made and ornamented along the seams with colored embroidery thread and around the tops with dyed membrane appliqué. The most beautifully decorated clothing often denoted status in Aleutian society, and was also worn for ceremonies.